Crossandra plants can be thought of as slightly easier cousins of the hibiscus (although they are in no way related). This plant is native to Sri Lanka and southern India and features narrow, oblong leaves and pale, peachy or coral flowers. They are tropical plants with showy blooms grown as bedding plants in tropical and subtropical areas and annuals in more northerly areas. While less commonly grown indoors, few plants can be relied on to provide this kind of flowering show under poor light conditions. If you meet their requirements for moisture and light, they are sure to reward. When growing them outdoors, they can attract butterflies. 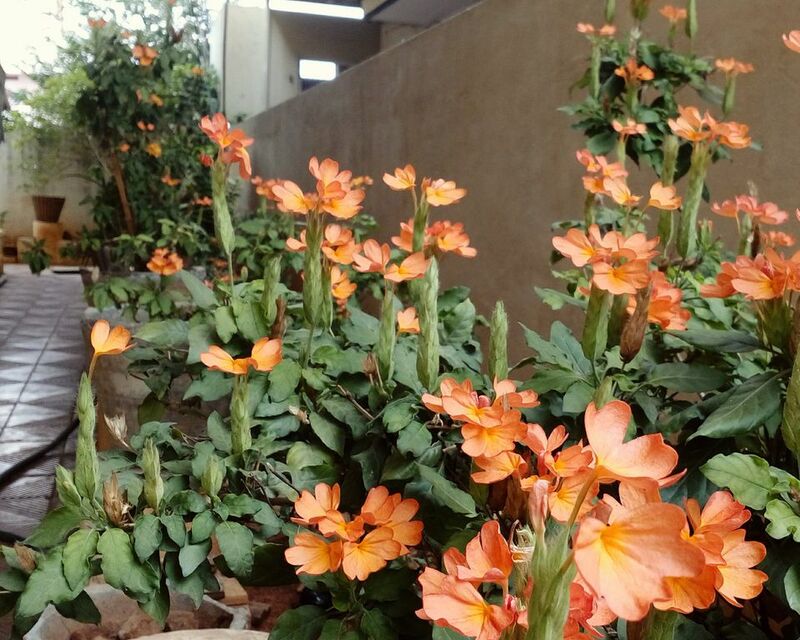 Crossandra is commonly seen as bedding plants in subtropical and tropical areas, where they are used for their wonderful color in light shade situations. These are among the few plants that provide months of lovely blooms in the bright shade—thus they are especially valuable when paired with other shade-tolerant plants for color, including ​impatiens, coleus, and shrimp plants. Indoors, crossandra provide many of the same charms. They are tolerant of low light and provide long-lasting flowers that will provide constant color from late spring to autumn. You can also enhance the bloom by removing older and dying flowers. Better yet, the blooms are available in a wonderful array of pale peach and coral colors—not very common colors among indoor flowers. As a result, these plants will do well when grouped with other colorful plants, where they can be shown off to maximum advantage. That said, though, crossandra do have relatively high water and humidity requirements and cannot tolerate cold. These plants thrive best in bright, indirect sunlight. During summer, do not expose them to direct sunlight. In winter, provide as much light as possible. Indoors, your plants can do well with bright artificial light. A rich, peat-based potting soil ​with excellent drainage is beneficial. If grown outdoors, it needs to be in a well-drained spot and will enjoy having compost provided for nutrients. During the growing season, water frequently and never allow the soil to dry out. They are very susceptible to drought. If you are growing them indoors in pots, you can water less often during the winter. Crossandra is very heat-tolerant and cold-sensitive, as befitting a plant that comes from the tropics. If the temperature goes below 55 degrees Fahrenheit, it can experience damage to the leaves or the top growth. In more arid climates, it might be necessary to mist the plants weekly during the growing season to provide ample humidity. Indoors plants can also be provided higher humidity if you place them on a tray of pebbles that is filled with water, so long as the water doesn't touch the bottom of the pot. Feed with a weak liquid fertilizer every two weeks throughout the growing season. Cut fertilizer back to once a month or so in the winter. Although they are perennial shrubs in their native habitat, it's not uncommon for indoor gardeners to essentially treat Cassandra plants as annuals, only keeping them until their bloom is over and their leaves begin to drop, then discarding the plant. If you do overwinter the plant, repot in spring into a new container with fresh soil and provide plenty of indirect, bright light for the transplant. Propagate at repotting time. Crossandra readily roots from cuttings. For best results, take cuttings early in the spring growing season, use a rooting hormone, and plant the cuttings into seed-starting soil. Provide bottom heat and plenty of humidity until new growth emerges, then move to their permanent location. Young plants grow quickly and will likely need to be repotted within the first month before they begin to bloom. There are about 50 species of Crossandra within the larger genus. They are all native to subtropical regions, including India, Southeast Asia, Africa, and Madagascar, where they are understory and border plants. In the garden trade, however, only one species is common: C. undulifolia (also sold as C. infundibuliformis). Breeders have introduced some color variations, including the 'Mona Wallhed', which has a lovely flower color. Crossandras are sometimes vulnerable to mealybugs, aphids, and mites. Signs of infestation include tiny webs on plants, clumps of white powdery residue, or visible insects on the plant. Treat infestations as soon as possible to prevent them from spreading to the rest of your collection. As always, start with the least toxic treatment option first, only progressing to more serious chemicals if your initial efforts fail.